Sinking of the President  | What About Victoria? A larger consort, the 2400-ton President, joined the service in 1840. 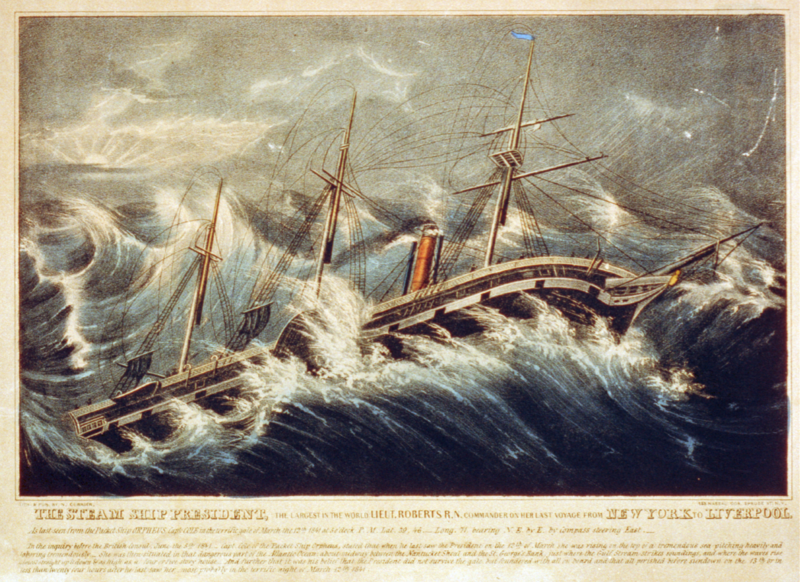 In March 1841 the six-month-old ship, largest steamer in the world, sailed with 136 passengers and crew from New York for Liverpool but never arrived, believed to have been the victim of hurricane-force winds and seas. An anxious public watched and waited for several weeks, their trust in the new technology waning by the day. As a direct result of this first North Atlantic steamship disaster, the Company immediately ceased trading. As the excerpt relates, this event was monumental at the time. Everyone heard of it, and it served to shake public confidence in the new iron steamships in both the US and Britain. Queen Victoria showed concern, and people held out hope for months that the steamship would return. This sort of disaster, though not unimaginable, is much more unlikely to occur in today’s world due to the advanced meteorology, satellite and radar technologies of today. Had weather forecasting advanced further, disasters like that of the SS President may not have occurred. I am planning to explore further–perhaps in a future blog post, perhaps in a final paper or project–meteorology in the Victorian era. Possible source: Predicting the Weather: Victorians and the Science of Meteorology by Katharine Anderson.